milk them dry, flooding the market with knock-offs until it was no longer possible to squeeze an audience out of them. Thus, when Scooby Doo proved such a huge success with its four teenagers and a dog tooling around in a van and solving mysteries, the company followed it up with The Funky Phantom (three teens, a dog and two ghosts in a flivver), Josie & the Pussycats (teenage music group with a cat and on-board bad guys in a tour bus), and even a retooled version of The Addams Family (kids plus goofy, kid-like grownups, octopus and large carnivore in a creepy old house on wheels). The inevitable cleancut, handsome, leader-type kid was Mark, whose voice was done by Mike Bell (Plastic Man in his 1979 Ruby-Spears show, Lex Luthor in the same company's 1988 version of Superman). The inevitable token female was Debbie, voiced by Arlene Golonka (mostly a face actress). The inevitable beatnik/hippie/slacker type, the one that reminded viewers of Scooby Doo's Shaggy, was their mechanic, Tinker, voiced by Phil Luther Jr. (who has no other voice credits). Speed Buggy himself was played by the incomparable Mel Blanc, who did characters as obscure as Sneezly Seal and as prominent as Bugs Bunny. Incidental voices were by Alan Oppenheimer (Mighty Mouse) and John Stephenson (narrator for Ruff & Reddy). The crew traveled the countryside having adventures and (of course) solving mysteries, for only one season, but the 16 episodes were rerun over and over, most recently on Cartoon Network in 1996. In addition, Speed was part of the ensemble cast of Scooby's All Star Laff-a-Lympics (1977) alongside Dynomutt, Captain Caveman and other stars of defunct Hanna-Barbera shows. The show was reasonably but not overwhelmingly successful in merchandising. There was a comic bok adaptation from Gold Key, but it didn't have its own title — it appeared in a couple of issues of Fun-in, an anthology that also included Motormouse & Autocat; Inch High, Private Eye; The Cattanooga Cats; and other Hanna-Barbera properties. In 1975, Charlton Comics took over the license, and put Speed in his own book. It lasted nine issues, July 1975 to November 1976. 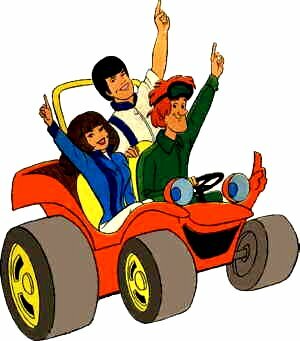 Speed Buggy isn't one of Hanna-Barbera's super-stars, but the repeated re-runs seem to indicate he has staying power. Text ©2005-08 Donald D. Markstein. Art © Hanna-Barbera.